Laura Marks is an infectious diseases fellow at Washington University in St. Louis, Missouri. 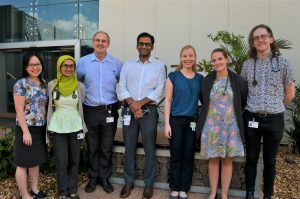 She recently spent three weeks in Darwin as a HOT NORTH visiting fellow where she undertook training at Royal Darwin Hospital to better recognise and treat tropical diseases. We caught up with Laura on her last day in Darwin to learn more about why she chose Darwin and what she learned from her experience. “In this day and age, you’re only a plane ride away from anywhere in the world and so are the tropical diseases people take with them,” said Dr Marks. Worldwide, 3.6 billion people took to the skies in 2016, flying to the far reaches of the globe. Australia sees around 40 million people coming through its terminals every year. Ultimately, and as some of us have experienced, a range of pathogens also make the journey, using their hosts to travel and spread far and wide. The CDC in the United States reports that travel related health problems are in as many as 22%-64% of travellers visiting developing countries. On their website, the CDC lists 41 diseases travellers should be aware of – some of which are specific to tropical regions outside of the US. For infectious diseases physicians practicing outside of tropical regions, identifying tropical illnesses in travellers can be difficult without specialised clinical training. Back in St. Louis at the infectious diseases ward, they often encounter tropical diseases in patients who are returning travellers or people living part time in another country such as Australia or Indonesia. “As part of my training, we have the option to go to other universities, hospitals and other areas to learn about different patient populations we wouldn’t be exposed to back in the States,” said Laura. For Laura, there’s a couple of reasons why Darwin was her number one choice for places to carry out her training. “In Darwin, you have that concentrated exposure to tropical diseases with world-class infectious diseases specialists. In my time here, I’ve seen multiple presentations occurring across a number of different diseases. This is helpful in my practice because I’m more confident to diagnose and manage a wider range of diseases that may end up in the Midwest of America. I can say ‘I recognise this, this is how we treat it and this is how we can provide excellent care.’ I’ve seen things here that I would never have a chance to see back in St. Louis. “Training here in Darwin has really opened up my eyes to how big the world of tropical medicine is and the team here have been amazing and so welcoming,” said Laura. And Laura knows a thing or two about tropical Darwin after spending much of her childhood living across the street from the hospital. When asked if she would consider making the move back to Darwin to work and live, Laura said “It’s something I’ve considered but the accreditation process to have my credentials recognised here is a long and difficult path. Moving back would probably mean not being able to practice medicine in Australia. But, I’d love to come back and do more training in the future. We wish Laura the best and hope she can make the journey back again someday!